This November, there will be only one statewide candidate out of seven in Virginia who doesn’t have “Republican” or “Democrat” next to his name. That individual is Robert Sarvis, who is running as a Libertarian for governor. (The other contests, for lieutenant governor and attorney general, feature only major-party candidates.) However, history suggests that his chances of winning are slim: Since the beginning of the 20th century, every Virginia gubernatorial winner has been a member of one of the two major parties. 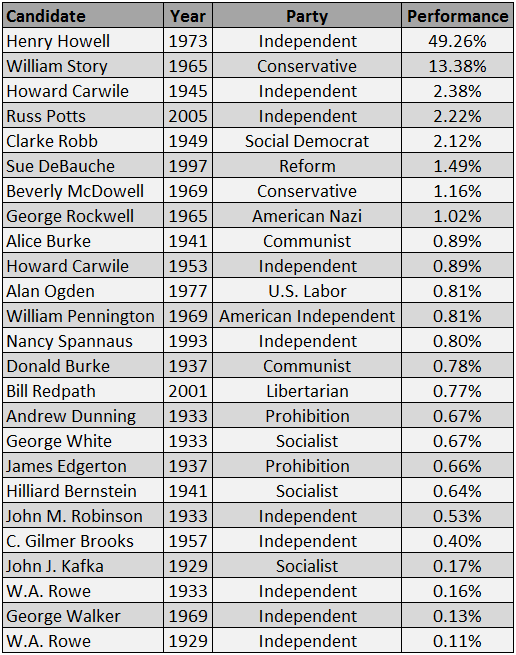 In fact, since 1925 only one non-major party nominee has come close to winning in the Old Dominion, and that was in 1973, when Democrat-turned-Independent Henry Howell lost by less than 1.5 percentage points to Democrat-turned-Republican Mills Godwin. But that election featured special circumstances: There was no Democrat on the ticket, just Howell, a liberal who had narrowly lost in the party’s fractious 1969 gubernatorial primary, only to then win a special election for the lieutenant governorship as an Independent in 1971. While Howell was backed by many Democrats, he eschewed the Democratic banner in 1973, possibly to help avoid connections to George McGovern’s crushing presidential loss only a year before. Instead, Howell’s backers engineered a resolution from the Democratic Party of Virginia “commending” his candidacy. Thus, Howell was, to some limited degree, the de facto Democrat in that year’s election. Besides Howell, no other independent or third-party candidate has finished higher than third in a Virginia gubernatorial election in the last 90 years. And only Howell and William Story, who ran as a far-right Conservative in 1965 due to a factional split among Virginia Democrats, have won even 3% of the vote. Table 1, below, details how well (or not well) these non-major party candidates have performed in that time. Sources: Virginia Votes, 1924-1999; Virginia State Board of Elections. Given that the best anyone has done besides Howell and Story is not even 2.5% of the vote, it’s evident why we view Sarvis’ chance of winning in November with considerable doubt, as we mentioned in our recent ratings update of the Virginia race. Also worth noting is Bill Redpath, who is the only Libertarian candidate to run in a Virginia gubernatorial election prior to Sarvis. Redpath garnered just 0.77% of the vote in 2001, which doesn’t raise expectations for Sarvis. Still, with two controversial and flawed candidates running with him on the gubernatorial ballot line in November, Sarvis may attract enough votes to place him high on this list the next time we run it, four years from now. We are delighted to report that Senior Columnist Rhodes Cook is making swift progress in his recovery from major surgery in mid-August. It won’t be long before Rhodes is drowning in election data again and writing additional perceptive essays for the Crystal Ball. We know you, our readers, join us in wishing Rhodes well (and his wife, Memrie, too).